When I was trying to get my Mom to come to Dragon Con she had two major arguments against going. One was that she was too old. LOLOLOLOLOLOLOL You are NEVER too old to go to con. The second argument was that she was not in the best shape of her life. OMG! I had to work hard to convince her that she would not be the oldest by far. Also she was lucky. While she may not be as spry as she used to be, she was able to walk. MANY people who come to con have all sorts of disabilities. Hell, there is and entire department dedicated to helping those who may need it. I took all sorts of pictures of people of all ages, sizes and mobility levels. Even with photo proof she thought she was in the minority. Now, years later she is still surprised at how many people her age that were there. I do not see why she is shocked. Nerds, dorks, geeks, whatever you want to call us come in all ages and sizes. There are people I have talked to at con well into their 80's. My Mom has quite a few years to go before she catches up to them. Disability services alone is unbeatable for what they do for people who need assistance. OMG! There are hundreds of people that Disability Services assist every year and without their time and generosity so many great people would not be able to attend. Facebook has Dragon Con groups for almost everything you can think of. There is a group called DropbyDragonCon for those trying to lose weight. A group for folks who are over 40 years old. There is even a group for people new to con. Not to mention all of the groups for the individual tracks themselves. Check some of them out. 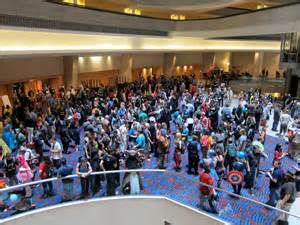 I have been to many many cons and I consider Dragon Con to be my con or better yet, my home con. Kind of like it is my home. Of all of the other cons I attend, Dragon Con is the most inclusive of everyone of every size, shape, race, religion, mobility level, or any other person you can come up with. I am so proud to tell my friends I come here every year. I can not believe what an amazing job the con and all of the volunteers do to make this so accessible and enjoyable to everyone. To all of the people involved in this con I not only congratulate you for such an excellent job, but I thank you for all of your dedication and hard work.